A RUDN employee and Brazilian colleagues have called into question the concept of using stable wormholes as portals to different points of space-time. The results of the studies were published in Physical Review D.
Wormholes are a recurring motif in science fiction. A wormhole is a sort of tunnel that joins distant points in space, or even two universes, via space-time curvature. Theoretically, such a tunnel could be traversed from one point in space to another without actually traveling the distance between them. Roman Konoplya, a RUDN physicist, evaluated the possibility of such interstellar travel. "Our hope for the existence of these exotic objects rests on the fact that Einstein's equations allow for wormholes as their solution. 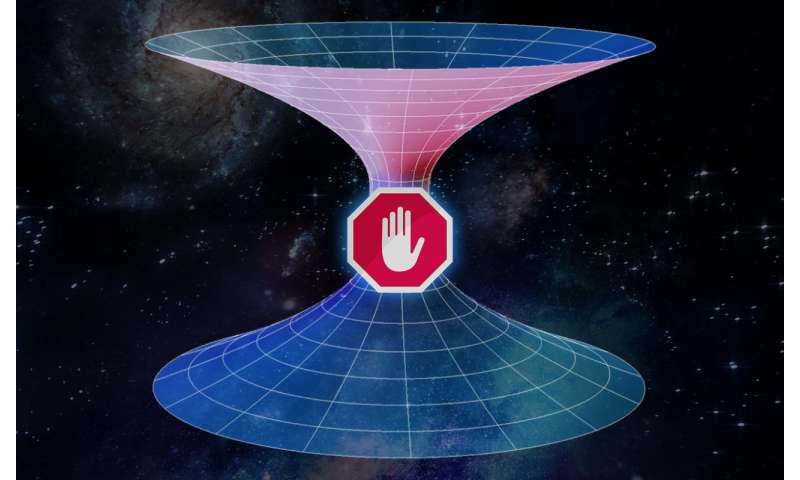 However, for wormholes to be traversable and not to collapse because of gravitational effects, the repulsion force in the bottleneck of a wormhole should be extremely high," says Roman Konoplya. Usually, theoretical physicists suggest two options for this repulsion force: concentration of dark energy or vacuum fluctuations of quantum fields around the bottleneck. Both solutions are quite unusual and require a certain extent of imagination and optimism to be further developed. In 2011, Greek and German scientists found that the repulsion force can be explained without introducing new fields or unusual types of matter. According to their calculations, the repulsion is possible simply as a result of quantum corrections of Einstein's theory motivated by string theory in the low energy approximation (the so-called Einstein-Gauss-Bonnet theory with dilaton). If a wormhole turned out to be stable against minor time and space fluctuations, it would be a prospective theoretical model inspired by the fundamental string theory. "Some preliminary studies of foreign colleagues seemed to indicate the possibility of such stability. However, we confirmed that a wormhole according to Einstein's theory with quantum corrections is critically unstable. Evidently, an unstable system cannot exist in nature as any reaction with the environment would cause it to disintegrate. Mathematically, it is expressed in unlimited growth of initially neglected minor system deviation from statistical balance. Unfortunately, these results mean that we still don't have a theoretically consistent wormhole model without exotic assumptions," said Konoplya.